That is David Hidalgo of the group Los Lobos and he is playing a requinto jarocho a four-stringed twelve fret instrument native to Mexico. It is used in various forms of traditional Mexican folk and dance music played with a large stiff pick, the most common tuning being ADGC but there are other variations. 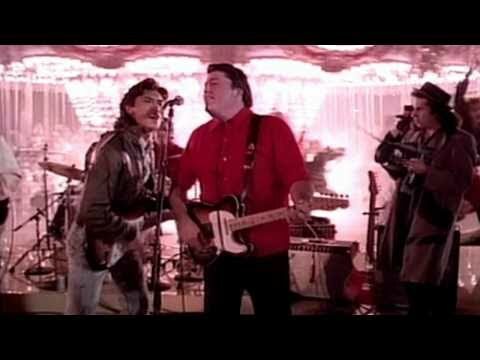 Los Lobos made their name mixing Mexican music with rock in L.A. but they did make an album of more traditional Mexican tunes 'La Pistola y El Corazon' back in 1988; well worth checking out if you like that sound. That is indeed a requinto jarocho (also known as guitarra de son). 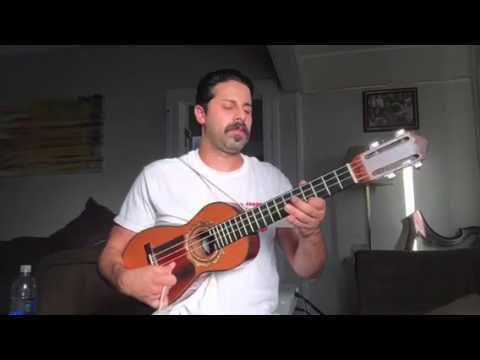 The tuning varies (CDGC, GADG, ABEA, AGDC for 4-string requintos; CDGCF, GADGC, EADGC for 5-string instruments) although I'd argue that the most common tuning is CDGC... and some will even argue that the requinto is tuned in G and the guitarra de son in C.
The instrument is from the Huasteca region of Mexico (more precisely from the Veracruz huasteca). It is traditionally used in the music of the region (son, huapango). So cool! As a native South Texan this really speaks to me. Has anyone ever tried to arrange this for a regular 6 string guitar? It would sound great on a Gypsy jazz guitar. That's great! Many thanks for the detailed replies, it sounds fantastic!